You can see old town of "Porvoo" on the upper left-hand, "Northern Lights" on the lower left-hand (beautiful! 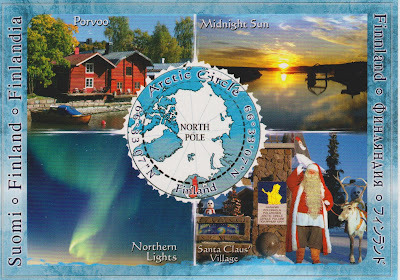 ), "Midnight Sun" on the upper right-hand, and Santa Claus living in Lapland up in the north on the lower right-hand. "Midnight Sun" reminds me of my visit to Finland in 1997 (Wow, that sounds so long ago! lol). I was so suprised that their sun didn't go down even at night! I had a very difficult time sleeping whlie I was there, and I wondered how Finnish people managed to have good sleep in summer when the sun is still so bright outside. Over here also at maybe 9 pm. I'm not quite sure to be honest :) When I lived in Colombia, I had a strict 12-hour day - the sun rose at 6 am and at 6 pm it was gone again. It was a weird feeling at the beginning, because it was still very hot, but - dark. 9pm sounds good, too! And 6pm sounds a bit to early to have the sun goes down esp. if it's still hot outside.